Sociologists Carol Heimer (Northwestern) and JuLeigh Petty (Vanderbilt) find that IRBs "substitute bureaucratic ethics for professional ethics." Much of the article consists of concise, accurate summaries of many of the complaints lodged against IRBs, including some by your humble blogger. (The bibliography lists well over 100 works on IRBs and research ethics.) Heimer and Petty categorize these complaints as "critiques of IRB law as law, critiques of IRBs as regulation, and critiques of IRBs as a system of norm making." Critics have charged that IRBs act lawlessly, do more harm than good, and deny researchers the opportunity to shape the norms that govern them. 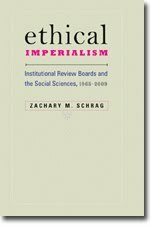 "IRBs seem to have lost sight of their original objective," Heimer and Petty state, summarizing some of this work. "No longer collective bodies of researchers deliberating together about the ethical dilemmas they encounter, IRBs are instead agents of the university (or research center). Rather than protecting research subjects from harm, they now seem especially focused on protecting universities and research centers." To these complaints (which they mostly seem to endorse), Heimer and Petty add three of their own. First, they employ the "lens of inequality," finding that "the regulations fail in part because the research process does not go as the regulators imagine and because the regulations do not address the social sources of the big inequalities. Furthermore, the regulations support inequality when they prevent research on powerful groups who harm others." IRBs fret over the details over consent forms, ignoring evidence that "potential research subjects actually pay little attention to consent forms and later do not even remember the details in them." At the same times, IRBs ignore "structural inqualities" (most notably, "the big inequality that the majority of the global research funds address the health problems of the wealthy few") while perpetuating inequality by preventing social researchers from studying powerful groups, including sellers of loose cigarettes. I find the section on "the big inequality" the least persuasive part of this article. Heimer and Petty too readily accept the claims of Jill Fisher and Adriana Petryna that (in the words of Heimer and Petty) "the focus on abstract, universal principles in the Belmont Report deflects attention from the structural conditions and inequalities under which the unethical treatment of research subjects has taken place." Fisher and Petryna mischaracterize both the Belmont Report and the Common Rule by claiming (in Petryna's words) that "so long as an investigator [can] document that his or her subjects could deliberate about personal goals and act 'under the direction of such deliberation,' it [is] ultimately up to the subjects themselves to judge the acceptability of the risks they [take]." In fact, the Belmont Report specifically warns against imposing the burdens of research "upon poor ward patients, while the benefits of improved medical care [flow] primarily to private patients," and the Common Rule requires IRBs to determine that "risks to subjects are reasonable in relation to anticipated benefits" and that "selection of subjects is equitable," independently of ensuring informed consent. Whether IRBs are able to do this, and to do this without inappropriately restricting a great deal of ethical research, is another question. But it's unfair to charge the National Commission or the authors of the regulations with ignoring the problem of structural inequality and the challenge it poses to a consent-based model. After the section on the "lens of inequality," Heimer and Petty "look at IRBs through the lens of professions." Noting that "the regulation of human subject research is a growth industry," they warn that rather than cede the power to declare a project exempt (as suggested by accommodationist reformers like Levine and Skedsvold), "IRB professionals [may] defend and perhaps seek to expand their jurisdiction." In doing so, they are protecting "their livelihood, a secure niche on the edges of the research and scholarly world." And they will have help: "OHRP’s focus on documentation helps explain why IRB professionals and not bioethicists are the growth sector in human subjects regulation." Finally, Heimer and Petty "examine IRBs and research enterprises as organizations." Here they find that "a complex mixture of coercion by the government, fear of loss of funding, individual professional self-interest . . . and a desire not to be seen to be on the wrong side of a key cultural divide" do more to explain the growth of IRBs than do the Nuremberg Trials and other documented cases of unethical research. As the regulation of human subjects research has been institutionalized, professional competition and the protection of organizational interests seem to have carried the day. A bureaucratized research ethics is essentially an ethics of documentation. The task of translating the principles of autonomy, beneficence, and justice was never going to be easy. But translations that ignore structural inequalities, delay or reduce valuable research, and substitute bureaucratic ethics for professional ethics may not bring as much progress as we hoped. Does the NSF Have an Oral History Policy?